AREG is always looking for avenues to encourage amateurs out into the field to operate their stations. One of the unique ways to do this is to go and operate from a conservation park. Several awards systems have been established to promote this type of portable operation. These have been very effective in stimulating activity on the HF bands domestically particularly during daylight hours on 20 and 40m. There are various forms of these awards including Summits On The Air, World Wide Flora and Fauna and other National Parks awards both in Australia and abroad. 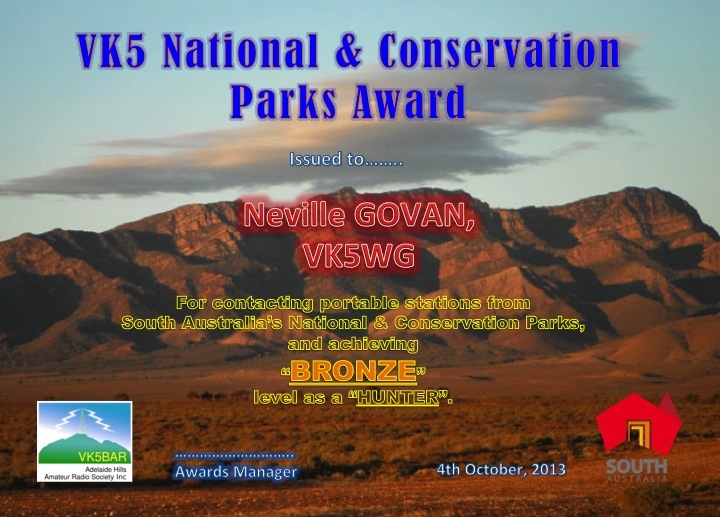 Paul VK5PAS has been a major champion of this type of operation and in particular is the founder of the VK5 National & Conservation Parks Award. At AREG’s next meeting on Friday June 17th, Paul VK5PAS will give a presentation on the Parks ‘N’ Peaks movement and the VK5 award in particular. The doors will open at 7.45pm and the presentation will get underway at 8.00pm sharp. After the meeting a short debrief will be given on the outcomes from the River Paddling Marathon that many AREG members are involved with this weekend. In addition to Parks n Peaks, Paul is now able to assist with the certification process for LogBook of the World. We hope to hear more about how to become registered for LOTW from Paul during the meeting as well. This entry was posted in HF DX Operating, Meetings by VK5GR. Bookmark the permalink.